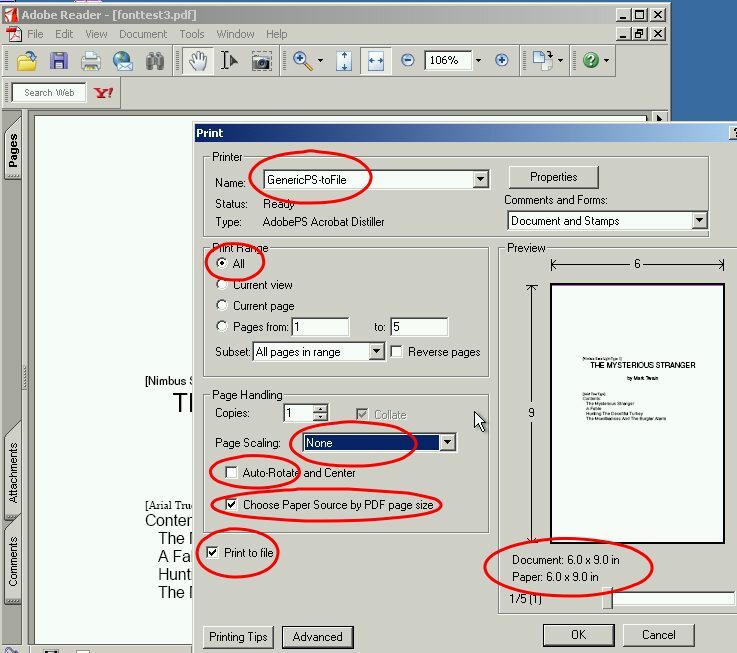 A common issue is that a PDF is does not have all fonts embedded and there is a compelling reason that the PDF cannot be remade from scratch to get the embedding accomplished. Sometimes the only practical way out is to "redistill" the PDF by printing it to Postscript and then converting that Postscript back into a PDF. It should be emphasized that this is not for ordinary use. It is also important to make sure that you have all of the fonts that need embedding installed on the system that you are doing the redistilling from. Ideally, you would redistill on the same computer that you used to make the PDF in the first place. This tutorial assumes that you have installed the free software for making Postscript files described in my Postscript tutorial. 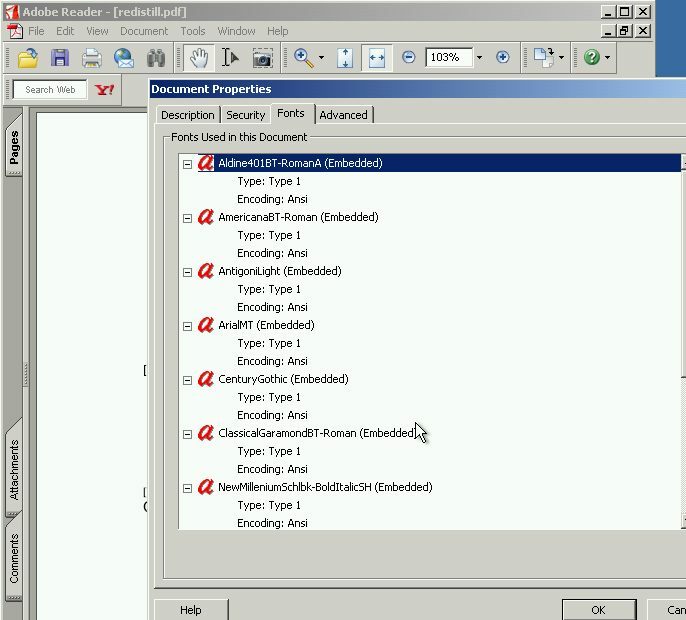 It also assumes that you have Adobe's Reader for viewing and printing PDFs. Missing next to the name of the font is the statement "Embedded" or "Embedded Subset." We want to change that. We assume that you have previously set up the postscript driver so that it defaults to sending True Type fonts as "softfonts" to the "printer." In this case the "printer" is our postscript file. Note that I chose to name my postscript driver "GenericPS-toFile" but you might have named it something else. If you have Acrobat it might be called "AdobePDF". You might have named the driver something different. You probably want all pages printed but you might not. You do want to print to file (this means Postscript file). Check to see that the paper size is right and the orientation is right. Step 3: click "OK" to print to the file. 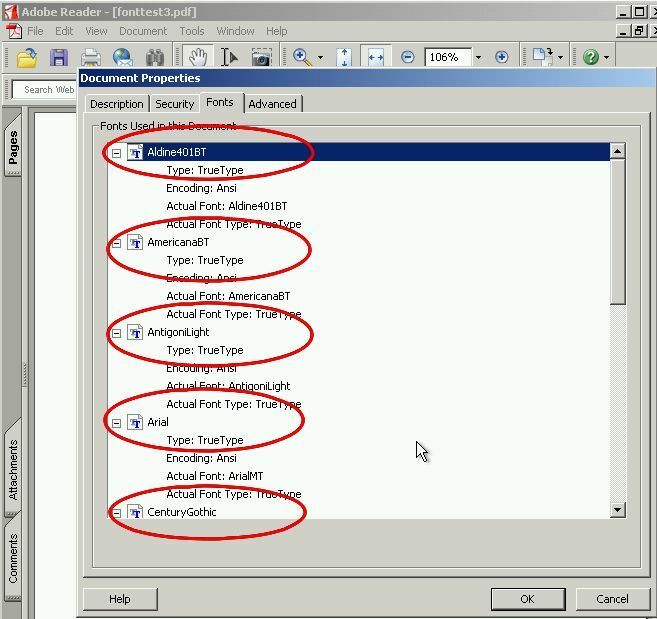 Give the file a name with a .ps extension as described in the Postscript Tutorial. What do you do with the Postscript file? You can either convert the Postscript file to PDF as described in the Postscript tutorial or you and upload it to Lulu for Lulu to convert to PDF. Redistilling is not for typical PDF creation. Adobe warns that redistilling can result in errors in the PDF, changes in image resolution and other issues. Most of these can be avoided with care, but a PDF that is made directly is usually the best solution. However, when a PDF is all you have to work with, redistilling may be your only option.